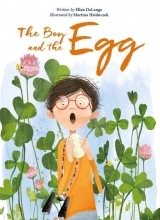 A boy discovers an egg and wonders what is inside. Could it be a turtle? A dinosaur? A new pet? Filled with humor and wonder this imaginative picture book is for nature lovers big and small.